We offer recycling of household batteries, lightbulbs, paint/paint cans and cell phones. 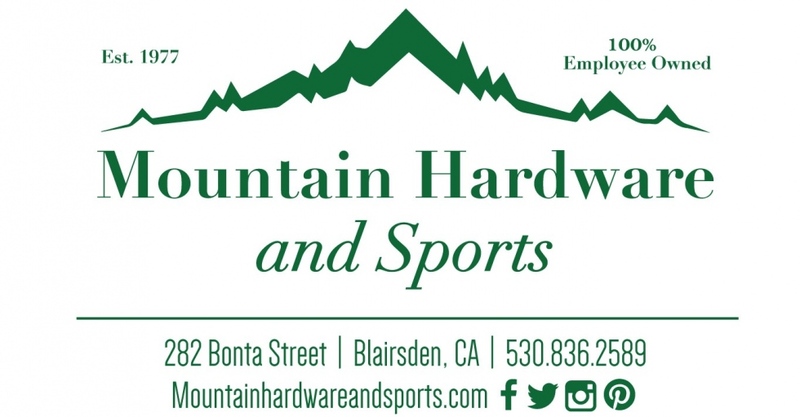 Mountain Hardware & Sports was established in 1977 by four long-time friends. Even with limited store space at that time, they knew great customer service would differentiate our business. From its inception, the business was built around providing top-notch customer service. Using this principle as our foundation, a member of our friendly and knowledgeable staff will always be available to answer your questions, find the right product, and provide task related information, while stocking essential hardware items, lavish delights, and everything in between. Ever growing and improving, we have added a store location and expanded our services giving you more. In February of 2001, we took our store philosophy to Blairsden CA, purchasing the local hardware store on Bonta St. It has been an exciting development for us, getting involved with another community in the northern Sierras. Now, with this Website, we are making an effort to make your shopping experience even more efficient and enjoyable. Bringing our unique product mix to your homes whenever you have a spare minute to surf.